After planting hundreds of fava beans, peas and trellises, and transplanting chard, lettuce and spinach, I looked at that hive, saw the bees hard at work, and knew it was now or never to go deep into the hive to see if I needed to do a brood box reversal. First I took off the outer cover, then the and inner cover (with the rim board firmly propolized to it). Then I lifted the top brood box off and set it aside. They get heavy, those deeps filled to the brim with bees, comb and honey! I pulled two central frames from the equally busy bottom box and ascertained that it had only food in it, mostly pollen. No grubs, no eggs. That meant the nest was all in the top box. This, according to many, is an precondition to swarming: the nest moves upward and if it finds there is no more space up there, they might leave (half of the colony leaves with the queen). I would not like a swarm! I’d want to catch it and keep it, of course, but there is no guarantee whether I would be able to. 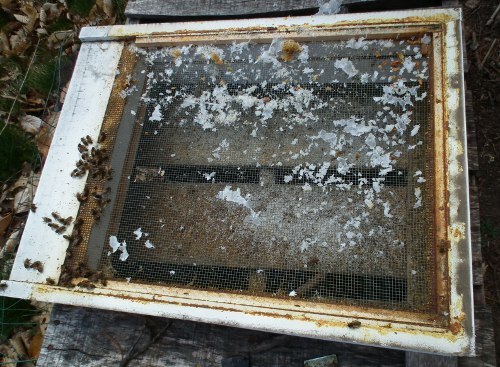 I had supered the hive – put a honey super on top – but the bees have only just started drawing out the comb on those frames. I also don’t want the queen in the super, which is supposed to be a honey super, not a third brood box. So I decided right then and there to reverse the two brood boxes. I had read on the forums that the best time to do this is “on the dandelion”. I looked around at the many fat dandelions in my yard and took that as a confirmation. Not one dead bee. The white stuff is the wax paper my sugar slabs were served on. It had disappeared, and there it was, shredded. Did the bees harvest the wax off of it? By now the ladies were pretty excited. Obviously. Foragers were returning to a hive that was cut up into many parts, all spread about, and there was light everywhere (bees like it dark in their house), and the wind was either chilling them or the sunshine was overheating them. The bees were all over me, taking a special liking to my gloves. I have never been stung through those calfskin gloves, and I didn’t want this to be the first time, just when I was handling a 60 lbs deep full of already agitated bees. So, no dwindling, no camera work – better get on with it! 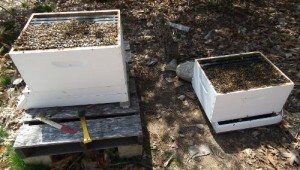 Switch boxes, quick check for swarm cells (queen cells that will be at the bottom of the frames), then add super, rim board with inner cover, outer cover. Done! Walk away. It’s one big puzzle of which I don’t have half the pieces. 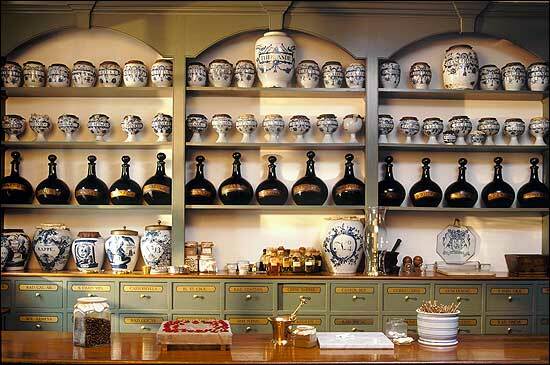 But the uncertainty and surprises are part of the fun.